Yesterday, a friend of mine shared this glorious, glorious piece of Internet with me through Facebook. This image is just basically a link to go to the article. Click it and giggle. Thanks, Deadspin! Click here to read the amazing thing, right now, in another window so you can come back and read this RIGHT AFTER. Before that very moment, I had never actively considered parental responses to Christmas Lists. 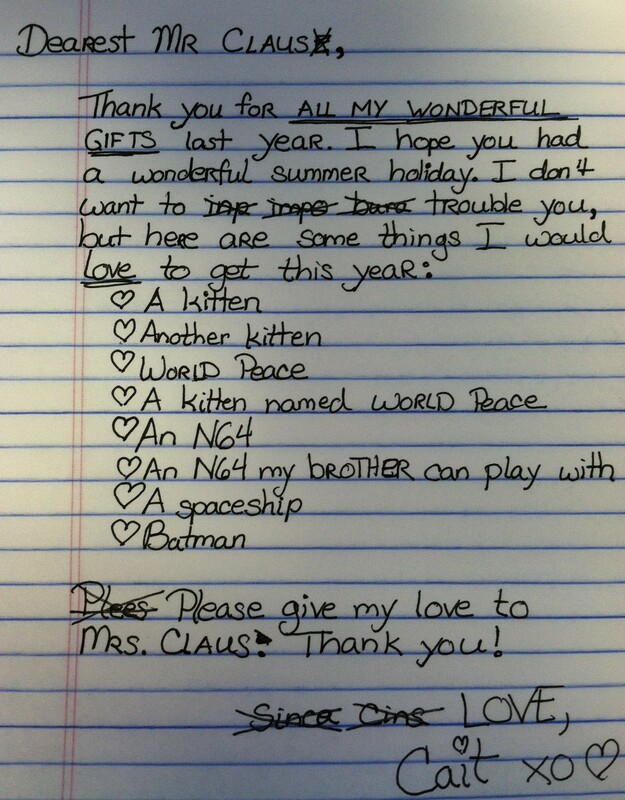 I sort of let all those badly-written, pleading letters to Santa drift away in my brain. Surely they were not a source of entertainment for my parents*. *In hindsight, I think maybe I’ve been sort of dense. In honor of this revelation, I have decided to recreate some of my childhood Christmas lists, as I remember them, with my parents’ respective responses as I imagine them. Because I believe in sharing. Terrible handwriting recreated for effect and realism. And no, “GIJOs” does not mean I was asking for giggalos. Mom: Awww! She wrote a letter to Santa! Precious! Dad: She cannot have a kitten. Mom: And honey, she wants Star Trek! Mom: We should get her a kitten. I was not above buttering up Santa. Or dotting my i’s with hearts. Mom: And honey, she wants world peace! I was really not going to give up on Santa. Or a kitten. Even though I already had a cat. Mom: Honey, I’m concerned. She wrote a letter to Santa! Mom: Does she still believe in Santa? Mom: We should get her a kitten to help her feel better. **Point of fact: I got a kitten for my 15th Birthday. PERSISTENCE, people. It pays. 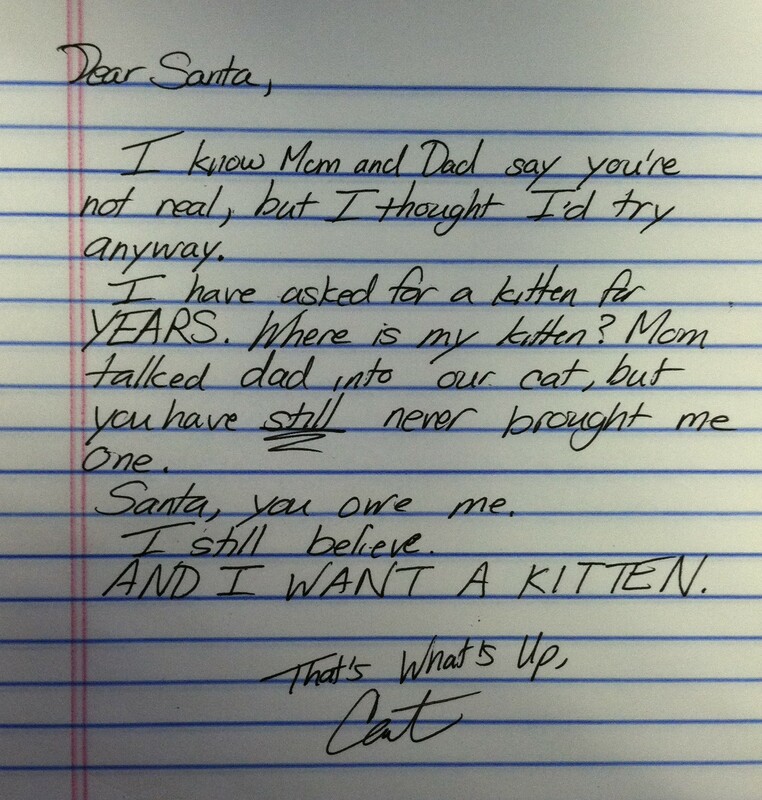 Growing up and giving up Christmas Lists is something of a tragedy. You lose your hopeful, unreasonable gift optimism. Now, when crafting my Amazon Wish List (the closest thing to a “List for Santa” my adult life offers), I pause to think about the feasibility of someone actually getting me that gift. ***In case you’re shopping for me, Stepney’s makes it. Click the image for a link! 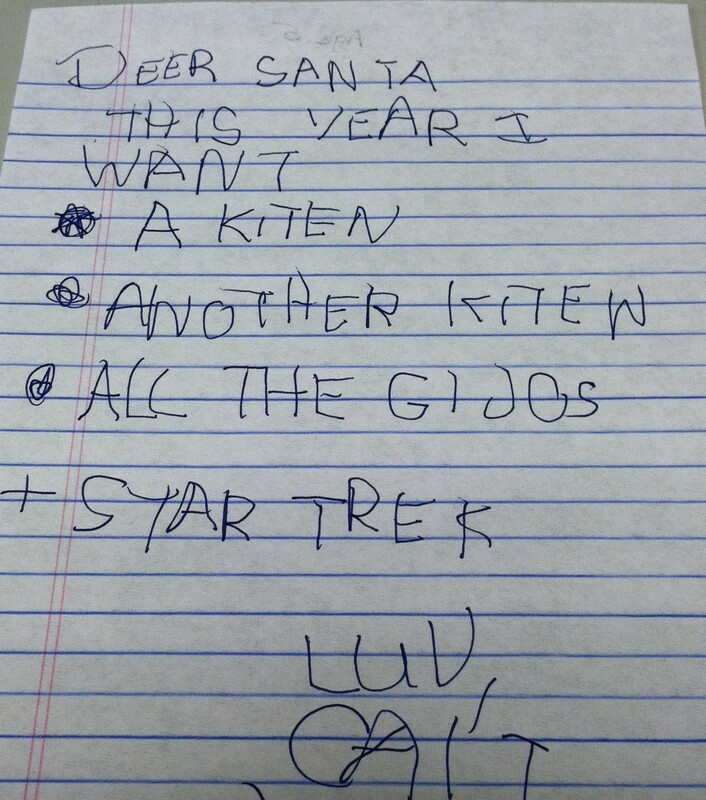 Nowadays, there isn’t even one kitten on my Wish List. The magic is dead, people. So, until I reached my full-and-independent-adult-life*, I didn’t really think the whole “Santa” thing was optional for Christian** families in America. My parents did it, and Santa is everywhere. There was clearly an undeniable math formula. Is this not how magic works? **Or agnostic. Or atheist. Or just capitalist-supportive. But now that I’m older, I know different parents make different choices for various reasons. And all that’s just Jim Dandy and delightful. However, I*** am a huge fan of Santa. Even when I found out that Santa happened to be Mom and Dad staying up really late and eating all the cookies, it still floored me that there were two people who were willing and able to make the world a magical place for me. So basically, by reading my blog, you’re running the risk of being exposed to lots of nostalgic, Santa-inclusive stories. You have been warned. 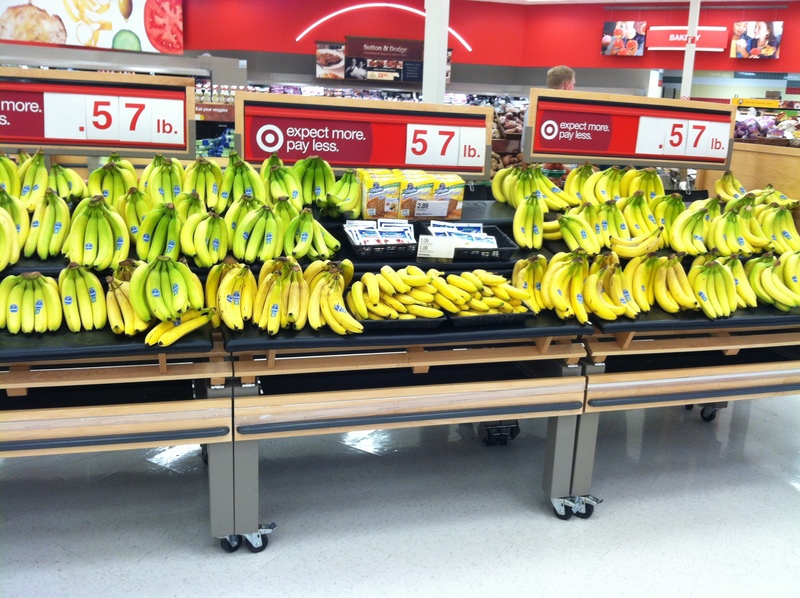 Also, Target has bananas again. You madam, are the bees knees. Excellent. I have been striving for that accolade since day 1.